RBTH presents a selection of views from leading Russian media on the latest developments in Ukraine, featuring forecasts for the potential meeting between the presidents of Russia and Ukraine as part of the Customs Union-Ukraine-EU summit in Minsk, Belarus on August 26, as well as news of the departure of two key Maidan figures from the Kiev administration. 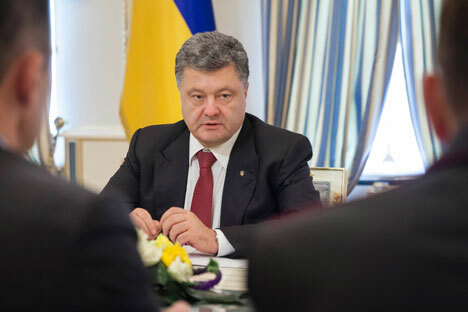 Expert magazine interprets the possible talks between Putin and Poroshenko as evidence that the Kiev authorities are leaning towards a diplomatic solution to the crisis. The publication attributes this to the fact that the military operation in the Donbass is not a favorable scenario for Kiev, and it is obvious that the Ukrainian Army will not be able to take Donetsk and Lugansk by Independence Day (August 24), when they have planned to hold a victory parade. “This [the meeting between Putin and Poroshenko – RBTH] presents an opportunity to at least start real negotiations,” the magazine quotes Valery Chaly, Deputy Head of the Presidential Administration of Ukraine, as saying. Experts interviewed by the Moskovsky Komsomolets newspaper are skeptical about the talks between Putin and Poroshenko. Sergei Mikheyev, general director of the Russian Political Environment Center, considers that the West is trying to put pressure on the Russian president. “Europe and the United States are trying to frame the issue this way: Russia undertakes to keep subsidizing Ukraine as it did before, and in return the West will remove sanctions that were imposed against us,” he says. According to Mikheyev, this formulation is of no interest to Russia, and the precondition for talks between Putin and Poroshenko should be a cessation of violence in the southeast of Ukraine. Accordingly, it is not possible to talk about a ceasefire as an obligatory condition for negotiations: On the contrary, a ceasefire would be the outcome of negotiations between politicians. Likewise, according to the newspaper, the need for negotiations is motivated by a desire, both on the part of Ukraine and Russia, to resolve this crisis peacefully – Ukraine’s economy is exhausted, and Russia, regardless of all its sympathies for the militants of Donbass, will not undertake a real military intervention. Another important newsworthy development was the departure from leading positions in Kiev of two prominent Maidan activists: Andriy Parubiy, former Secretary of the National Security and Defense Council (NSDC), has left the NSDC, and Tetiana Chornovol has resigned from her post as head of the National Anti-Corruption Committee. According to the newspaper, the popular leaders of the Ukrainian revolution have already fulfilled their role and are now openly uncomfortable for the new Kiev authorities. “Some of the leaders of the Maidan have disappeared, some have been killed, and some have been sent out of the country. And now they have turned to those who had recently been invited into the government,” Vzglyad quotes the Ukrainian political analyst Konstantin Shurov as saying. Therefore Poroshenko needs Parubiy in the current difficult situation. During the same interview, Stoyakin stated that the internal political situation in Ukraine remains very confusing: It is not even known which system will be used for the early elections to the Verkhovna Rada that will take place this fall. Stoyakin also suggested that in the near future, a serious conflict might break out in Ukraine between Poroshenko and the governor of Dnepropetrovsk, the influential oligarch Ihor Kolomoyskyi, whose influence poses a serious threat to the Kiev authorities.